Clematis 'Sunset' has brilliant red, large star-shaped flowers from early summer into September. 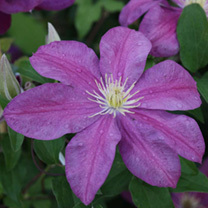 Blooms have deep pink margins, and yellow anthers, a very striking clematis for the container or wall-side border. Growing to two and a half metres tall, it will add bright colour to the sunny garden. Flowers July-September. Height 150-200cm. Supplied in a 3-4 litre pot.